It ain’t pretty, but Bookdog should save you hours when dealing with bookmarks. Most people have a large, ever-growing collection of browser bookmarks, which is rarely tidied. If you use multiple browsers, bookmarks may be spread among them, causing you to waste time when finding fave sites. Bookdog is specially designed to deal with these problems. 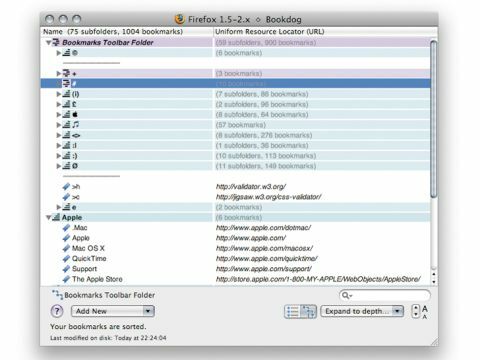 Essentially, Bookdog enables you to manage/synchronise bookmarks from popular Mac browsers and del.icio.us. For management, you open one or more bookmark files (via File > My Macintosh Account) and can then reorder, move and delete bookmarks and folders. The new integrated search makes finding individual bookmarks a cinch, and Bookdog 5's honed-down interface takes up less screen-space, yet remains simple to use. Bookdog also offers automated functions, including alphabetical sorting, weeding out of duplicates, and bookmarks verification. The latter rifles through your bookmarks, testing whether each online resource still exists, and presents you with a report that enables you to decide how to deal with duff URLs. For synchronisation, you choose a source and target browser, and decide whether to merge bookmarks, copy from one source to another, or obliterate any duplicates. This procedure worked well and was astonishingly quick, although advanced features don't always transfer (notably keyword searches), and there's no way to easily synchronise across three or more browsers (although Bookdog's documentation hints at how to do this using Automator). Overall, Bookdog is a strong application, and one that has the potential to shave hours off a normally thankless task. The occasionally clunky interface is countered by excellent documentation that brings newcomers up to speed and provides handy tips for long-time users.